So as some of you guys may know, I'm a cheerleader! 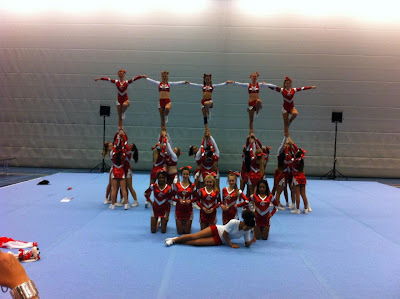 When I started cheerleading about a year ago I had no idea what to expect, to be honest I tought that my squad was the only one in the netherlands. as it turned out to be there are about six or seven other squads competing in the netherlands, and it is growing every year. anyway enough with the boring statistics. So last sunday was the second big national competition in Utrecht, My squad and I got second place so I'm proud of my team. after the award ceremony there was a 5 hour workshop in which we learned a lot of stunts, our coach was a scottish guy from SCOcheer. Well, I've learned a lot in my year of cheerleading. I'm just wondering what on earth I'm going to do in summer break becouse I don't think I will survive six to eight weeks of no cheerleading. Do you have any questions or do you want to cheer but don't know where to begin? please leave a comment!